Glassware is an important part of our everyday lives, whether it is at the breakfast table or the cocktail hour. It is often said that the right glass can enhance the drink you serve. Glassware is also called stemware, drinkware, beverage ware and barware. Glassware includes drinkware for beverages, vases, pitchers or containers used in kitchens and tables, art glass and art marbles for decorative purposes. Find out more on antique glassware. Glassware is available in a gamut of shapes, sizes, colors and decorations. Glassware can be plain or decorated, clear or colored, formal or informal. Glassware has evolved into specific shapes and sizes according to the type of liquid it holds, be it water or wine. Wine glass is designed to maximize taste and aroma by delivering wine to the right part of the mouth as well as being shaped properly to catch and concentrate on the scents of the wine. Long stems help to keep the heat of the hand away from the wine. Wine glass should be narrower on the top and large on the bottom. Glassware comes in different types according to the purpose they serve. The glassware used in a bar cannot be used in-house or at a business place. Coffee cannot be served in a beer mug nor cocktail in a coffee cup. Beverage glassware includes water glasses for informal dining or everyday use. Water is normally served in tall columnar shaped tumblers. Water goblets consisting of stem with round shaped bowl, are used in formal settings. These water goblets are made of lead crystal, cut glass with etched decorations and hold about 8 ounces. Juice glasses are usually much smaller than water glasses. Juice glasses were used traditionally only at breakfast tables. Today they are used throughout the day for various beverages. They come in medium and large sizes as well. There is stunning range of bar glassware available - beer mug, beer pilsner, brandy snifter, champagne flute, cocktail glass, high ball glass, red wine glass, sherry glass, shot glass, whiskey sour glass and not to forget, the white wine glass. Most wine glasses are referred to as stemware. Wine glasses are normally clear in color to enable the wine drinker to examine the color of the wine. A standard wine glass holds about 12.5 ounces and a red wine glass about 8 ounces. It is said that there is a different place in the mouth for each wine and hence the different shapes for glasses based on centuries old concepts. 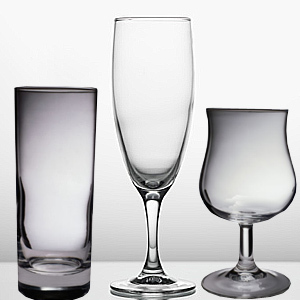 Cocktail glass come in three basic types. The double old fashioned glasses are short and made of heavier glass, They are used in classic cocktails and hold 8 to 10 ounces. The highball glasses and tumblers are taller and narrower. They are used for mixed drinks and hold 8 to 12 ounces. The martini or cocktail glasses come in triangular shaped bowl and used for martinis, gimlets and other cocktails. Champagne flute is the preferred choice of stemware for drinking champagnes. They are flute shaped to keep the champagne chilled and prevent the bubbles from escaping too fast. Cordial glasses resemble miniature wine glasses but can bold only 2 ounces.They are used for drink liqueurs, sherry and port. Brandy snifters are designed to concentrate on the aroma of the brandy up towards the rim of the glass. Normally they have a wide tulip shaped bowl and a short stem. Beer pilsners are elongated tulip shaped glasses designed to keep the beer at an even temperature and prevent it from going flat. In order to retain value, antique glassware should be purchased in ‘mint' or ‘near mint' condition. This is the single most important factor in valuing antiques and collectibles. This condition will fetch higher price than those with flaws. However there may be occasions where an antique with condition factors will still be worthy and fetch a good sum. This depends on the rarity of the antique. Detecting chips: Gently run your finger around the rim, base and handle areas to check glass for chips. Take care if you feel sharp spots to avoid cutting your finger. Although some types of damage can be repaired professionally, it is wise not to buy antiques with major chips. A repaired antique will never be worth as much as comparable piece in mint condition. Detecting cracks: Hold each glassware to the light to see if the cracks are visible. Professional collectors use ‘black light' to detect if any glue has been used to mend cracks. Ceramic items will emit a dull sound, when tapped if they are cracked. Excessive wear and sickness: The surface of the glassware has to be inspected for excessive scratching and other wear. Some dishwashers can cause permanent etching and film or cloud the surface of glass. This problem is bound to occur mostly in Depression glass which is referred to as ‘sick' glass because of the cloudiness. This sickness is virtually most of the times irreparable. A discerning collector has to be sure that all the parts of the antique are present in full complement. An ill-matched bottom with a different type of stopper, or a cup with china pattern married to a saucer that is not its' match can only affect the antique value. A collector has to be careful about reproduction. Buying more expensive pieces from reputable dealer is a good way to avoid reproduction. Many antique lovers use long wave black lights to date objects and test for authenticity. The fluorescence under ultraviolet light helps to indicate signs of repairs and clues on age of the item. It is essential to look for manufacturer or designer's mark in an antique item. This is more worthy than items with no signature or stamp. A collector has to identify each piece carefully for valuable identifying signs, like the artist's signature or a manufacturer's mark. Research libraries also provide information on collectibles. Large bookstores also sell books on collectibles. Guides on collectibles are also available in local libraries. The price of an antique can be obtained from price guides that are normally located on websites. Visiting online auctions and comparing prices is a convenient way of assessing the approximate value of an antique. The prices for antiques can fluctuate widely and quickly depending on current demand. Prices can suddenly drop down once the boom has passed or remain high due to diminished supply. It is important that a collector watches the market regularly to study price fluctuations depending on market influences. Caring for antique glassware is itself an art. It is essential that antique glassware is maintained in good condition especially if the collector tries to sell a treasured antique in the future. Improper cleaning: Cleaning can enhance the value of some antiques, but it is not always the case. Sometimes cleaning can diminish the value greatly. There fore it is better to do some research to find out how cleaning will impact the value of an antique before you begin. It is also advised to talk to an expert collector or dealer if needed. Displaying in sunlight: It is always advised to display antiques in dimly lit areas or for short periods of time in sunny rooms. Always avoid direct sunlight. The term Depression glass first appeared in the publication Antiques Trading in 1969. Depression glass is machine-pressed mass produced table and kitchenware that flooded the market in the 1920s to 1940s. They were both colorful and clear. It was made popular by movie theaters that used them to entice audiences on slow nights. Today experts feel that Depression glass in the number one collectible. While it is common that most antiques are treasured for their rarity and quality, Depression glass was made by the millions was widely used because of its economical price. The original cost of Depression glass was 5 to 10 cents. This perfectly fitted the working class budgets. Nowadays individual pieces of Depression glass are available for under $ 20. Today Depression glass has captivated the American markets and has enchanted the public by its stunning array of patterns and kaleidoscopic colors. In fact Jimmy Carter displayed his Georgian Lovebirds glassware pattern in the State House of Georgia when he was Governor in the US. George Washington's image appeared on a tumbler from Hazel Atlas. Several popular characters have appeared on children's mugs. Depression glass is widely used in casual dining settings at home. This is because the colors offered by Depression glass, namely, red, blue, pink, green and amber and clear fit into most color schemes. They are known for their premium prices and also for their beautiful displays of hard to find sets, created in dozens of patterns ranging from plain to playful to elegant. Patterns of Depression glass range from the stylish art decors to simpler homely floral designs. First Published Date: Oct 13 2006 Last modified Date: April 18 2019 This page may have been updated recently as new information is available or the content may have been edited for better readability.